Kurtis Ceppetelli and Matthew Malone form the dynamic artistic duo known as the Duly Noted Painters. See their most recent body of work Saturday at the Brookland Artspace Gallery. Image courtesy of the artists. Pepco Edison Place Gallery – 6 p.m. to 8 p.m. Courage on Canvas features the works of Life Pieces to Masterpieces’ young artists. For more details, click here. Pepco Edison Place Gallery is located at 702 8th St. NW. Join Touchstone Gallery for the opening reception of the month member group show, The Quality of Light by Pete McCutchen, and HUSK by Anthony Dortch. For more details, click here. The Black Doll Show features handmade works by renowned doll artists Betty Baines, Gwendolyn Aqui Brooks, Francine Haskins, Jeri Hubbard and Paula Whaley. The artists will be in attendance. For more information, click here. 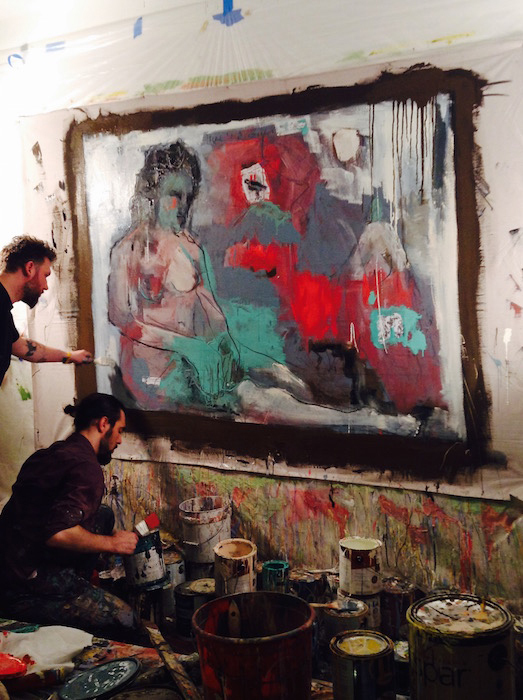 Brookland Artspace Gallery – 3 p.m. to 7 p.m.
Duly Noted Painters presents the opening of NOW & THEN, an exhibition featuring the collaborative paintings of Kurtis Ceppetelli and Matthew Malone. For more information, click here. Brookland Artspace Gallery is located at 3305 8th St. NE. Capitol Hill Arts Workshop – 5 p.m. to 7 p.m. The Capitol Hill Art League Kicks off their 2015-2016 season with the opening of their October Juried Show at CHAW. Twenty-five artists will present in a wide range of media. For more details, click here. CHAW is located at 545 Seventh St. SE. Smithsonian Anacostia Community Museum – 2 p.m. Guests are invited to discuss the growing role the arts can play in the future of neighborhood revitalization. For more information, click here. Studio SoHy – 5 p.m. to 10 p.m. The SoHy CyClo Show features the works of over twenty local DC metro artists whose works focus on their interpretations of cycling. Artwork will be on sale during the opening reception. For more details, click here. SoHy is located at 4327 Gallatin St., Hyattsville, MD. Smithsonian Anacostia Community Museum – 11 a.m.
Sign up for docent-led tours of the exhibition How the Civil War Changed Washington. This tour has components for guests of all ages. For more details, click here. Hill Center Galleries – 6 p.m. to 8 p.m.
Join Hill Center Galleries for the opening of three new exhibitions: Shades of Pastel, Faces & Places, and Faces of Spirits. For more information, click here. Hill Center Galleries is located at 921 Pennsylvania Ave. SE.